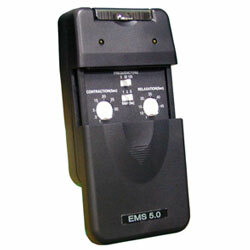 The Roscoe Medical EMS 5.0 Muscle Stim gives support, warmth, and electrotherapy stimulation to the knee. Self Adhesive electrodes often are not large enough and do not adhere properly on the knee, which makes this product so popular. The Roscoe Medical EMS 5.0 Muscle Stim is designed for personal use, however it is strong enough to be used in an office setting. The EMS unit uses electrical impulses to contract and relax muscles helping those who experience muscle tension in the upper back and neck areas. Can be used to regain muscle strength after surgery or being in a cast. The EMS unit is portable and may be clipped to a belt, shirt, pocket or other clothing. Caution: This is a Class II Medical device and Federal law Restricts this device to sale by or on the order a Physician. Please Contact us at 1-863-686-0300 to order; we will provide you several options to transmit your prescription to us.